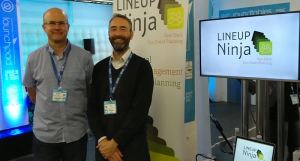 Lineup Ninja saves event managers time and helps them avoid mistakes when managing content for their events. Powerful and flexible submission and review tools support a range of event types, including conferences, awards and festivals. 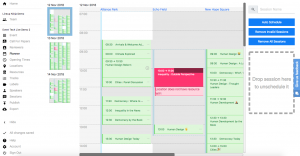 The smart agenda planner saves event managers time and reduces the risk of human error associated with the complex, repetitive and tedious job of scheduling sessions. This is particularly valuable for events with several simultaneous streams in multiple spaces. Bringing submissions and agenda tools together allows important details like speaker availability, AV requests and track preferences to be captured up front, planned for, and reflected in the final agenda. Submitters can upload files to the system so speaker photos, abstracts and papers, company logos, slide decks and more can all be kept together. Automated communications with submitters and reviewers saves hours of tracking emails and chasing people up. Unlimited user accounts and real-time features make it easy for teams to collaborate.